New “Normal Barbie” Gives Turkey Burgahs Hope – Expanding your culture, one touch at a time. When I was a young Mook, I thought G.I. Joe was the man, and not because he was balding and had a beer gut. With that being said, the 1990’s were much different than the world we know now. Everyone has to be accepted no matter what shape or size and that is perfectly fine and totally accepted. I don’t disagree with that; everyone has the right to be accepted, but when it comes to toys, let the kids dream. I would have never stole my sister’s barbies and undressed them ever so gently, if the Barbie was a turkey piece….ehhhh maybe I would of. I don’t hate on the “new barbie,” because it shows children at a young age that being yourself is ok. This new toy gives hope to all turkeys and even non turkeys. The youth being exposed to toy turkeys at a young age will teach them how to handle interactions with your everyday Charles or Lindas…..Le Pley. 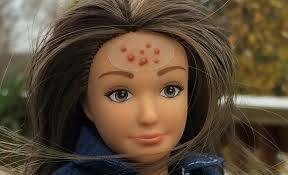 This Barbie also includes cellulite, stretch sark and some sort of forehead rash stickers. Oh boy…I can’t wait to get my sister one.